In which some folks may be surprised to find out that there is a much softer, child-like side to this particular Horror writer. I’m not all dark spooky houses and blood curdling screams. I’ve been desperately in love with Winnie The Pooh my entire life. On our first trip to Disney World (that’s the one in Florida) in 1972 I acquired my first stuffed Pooh Bear. I still have that bear. His fur’s not as thick and fluffy as it once was. One ear is longer than the other. His shirt is a bit grimy. And the top of his head is infused with more of my tears than I care to admit. He was and still is much loved. As with Christopher Robin, Pooh was my friend, companion and confidant when I felt no one else was even up into my teenage years. I still have my original set of Winnie The Pooh paperback books, my bedroom curtains, and will sit and watch the original cartoons at the drop of a hat when I can. When my son was born, his bedroom was decked out in all things Pooh Bear. 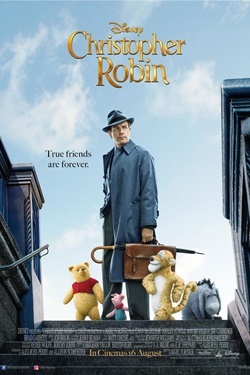 When I saw the trailer for Christopher Robin I knew I just HAD to see it. I mean, it’s POOH BEAR for crying out loud. Finally, thanks to Netflix, I was able to watch it earlier this week. I was in tears before the darn opening scene was over with! Christopher Robin is all grown up. He’s a busy, busy man with not a lot of time for his wife and daughter. Work is sucking all the life and fun out of him and he’s under huge pressure to make drastic cuts to the department he’s in charge of – 20% by the end of the week. Then, along comes Winnie The Pooh – in all his walking, talking, rumbling in his tumbly flesh, so to speak. He appears on a park bench where Christopher Robin finds him and immediately freaks out. What follows is Christopher returning Pooh to the Hundred Acre Woods only to end up staying there much longer than planned. The plot is super, super simple and because of that, I was rather disappointed. Even the Disney cartoons from the late 1960s had more interesting plots than this movie. I got the impression that each of Christopher’s co-workers was based around a resident of the Hundred Acre Woods – but this was never explored. Would have loved to have seen this happen. The animation was amazing and really blew me away, but even with that, the story just didn’t carry me as far into the world of Pooh as I wanted to go. It was dumbed down and simplified way too much and didn’t seem to take into consideration that long time Pooh Bear fans like myself would want to see it or journey back to our childhoods as Christopher Robin was able to do. Be all that as it may, I enjoyed it for what it was even as I wished there was more to it. I’m glad I didn’t pay theatre ticket prices to see it, though. It’s a cute movie with a good message even if the plot was not in the least bit deep. A bear of very little brain or not – Winnie The Pooh’s child-like wisdom is probably one of the best things going on out there in the world and for that, I’ll always love him. In honor of Pooh, I’m skipping my traditional Raven Rating system on favor of Honey Pots and giving this a 2 out of 5. It’s a nice little smackeral, but not nearly as satisfying as this particular chubby little bear had hoped for.